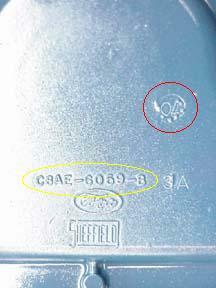 The front cover used on 428 CJ, SCJ, and other FE engines of the period is identified by basic part number 6059. 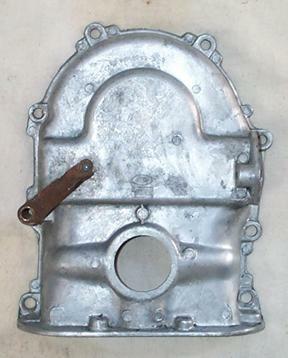 The cover is made of cast aluminum, and is bolted to the front of the cylinder block to protect the timing chain, timing gears, cam eccentric (used to drive the fuel pump), and crankshaft snout. This part was painted on the engine after installation, so the outside should normally be painted Ford Dark Corporate Blue. The fuel pump mounts on the left (driver's) side of the cover, the timing pointer is attached toward the right (passenger) side, and the crank protrudes from a large hole (which also contains a pressed-in oil seal) near the bottom. Gaskets seal the cover to the block and the front of the oil pan. 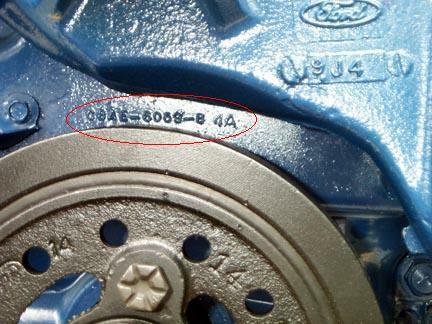 It appears that the 428 CJ, SCJ, and other FE engines used the same timing covers, identified by casting number C8AE-6059-B. 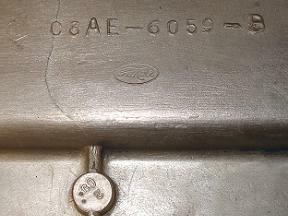 The 1975 edition of the Ford Master Parts catalog seems to confirm this as it lists the same cover for all 428 applications with part number C8AE-6059-B as part of a cylinder front cover repair kit. I've noticed different versions of the timing cover that use the same casting number, but they differ in the location of the number. I've also heard that some covers are missing the casting number completely. "Sheffield" (most likely the name of the company that cast the cover) and a stylized "FoMoCo" logo are often cast into the cover as well. 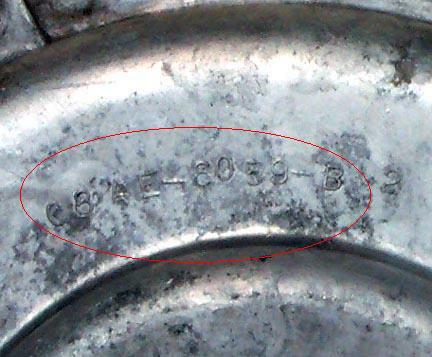 A two-digit date code identifying the year is usually found cast onto the cover. The month can be identified by the number of dots that encircle the year: two dots = February, six dots = June, etc. 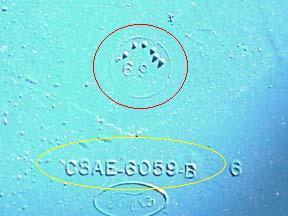 I've received reports of another cover, identified by casting number C3AE-6059-A, being used on CJ and SCJ engines. This cover was certainly used on earlier FE engines, including the 1966-1967 428 Police Interceptor and probably 1963-model year engines like the 406, but I have nothing to document their use on 428 CJs or SCJs. The timing pointer used on this cover attaches to the cover with two sheet metal screws mounted right onto the cover itself without using any of the bolts that mount the cover to the block. 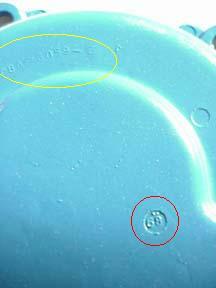 Thanks to Jim Woods and Bill Upham of Mansfield Restoration Parts for the date code images.